Note: Some information from this article was used in the writing of the 2019 book: A Voice of the Warm: The Life of Rod McKuen, by Barry Alfonso. 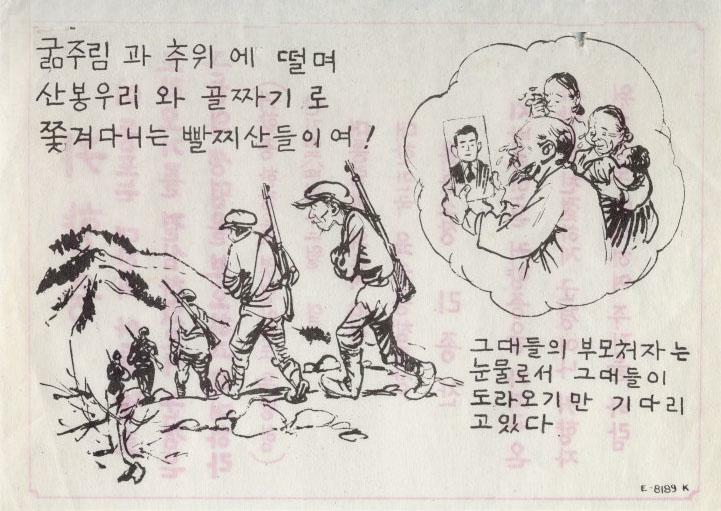 When one studies the thousands of propaganda leaflets prepared by the United Nations forces during the Korean War a strange fact becomes apparent. 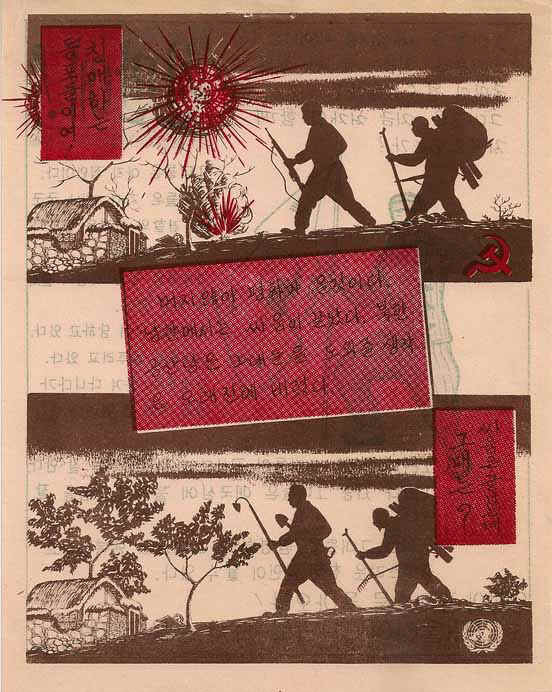 Although the majority of the leaflets target the North Korean Peoples Army (NKPA) and the Chinese Peoples Volunteer Army (Usually identified as Chinese Communist Forces or CCF), there are a great number of leaflets that were designed for use against North Korean Communist guerrillas that were left behind as the victorious UN forces pushed the retreating Communist forces north. I spoke to someone recently who believed that all the talk of left-behind Communist guerrillas was just a myth; a propaganda ploy used by the government. I assured this person that there were partisans left behind, in fact, thousands of them, with orders to sabotage and wreak havoc on the South Korean people and government. 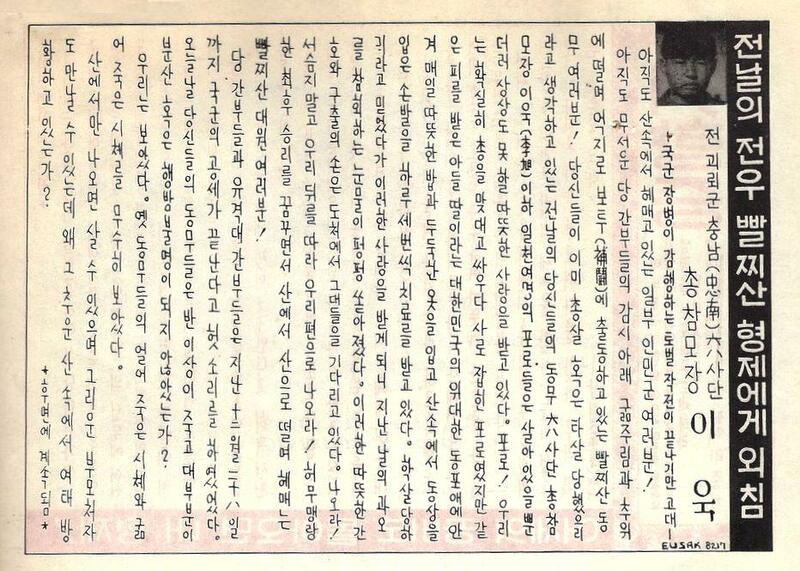 In fact, antigovernment guerrilla bands, some sponsored by North Korea were a problem long before the war began. It was estimated in 1950 that there were about 8,000 Communist guerrillas within the Republic of Korea. 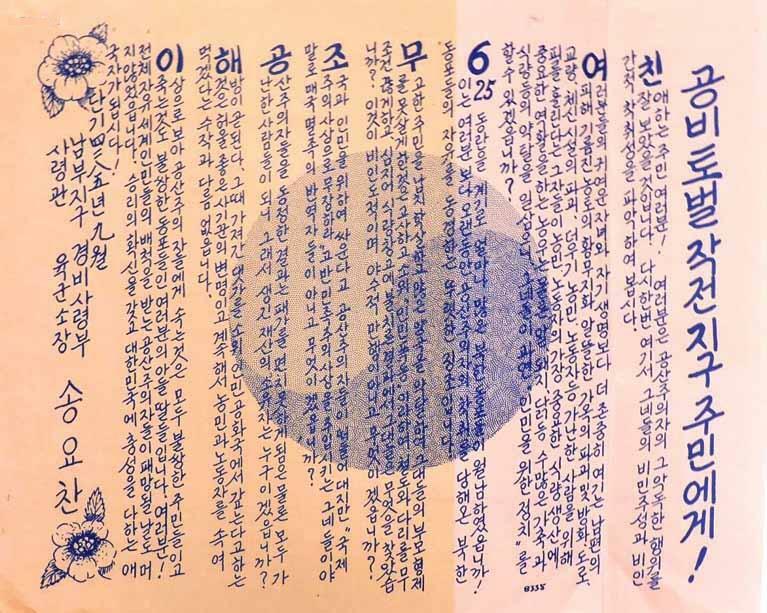 In this article we will very briefly discuss the military operations and the Republic of Korea officers and officials who appear on the various safe conduct passes and surrender leaflets, and then illustrate about a dozen of the leaflets. As I said above, I probably could show a hundred of them, but my intention is just to show those with interesting images. The leaflets depicted are from my own archives, military archives and the Albert G. Brauer collection in North Dakota State University. In the final phase of the Operation, Task Force Paik again swept through the Chiri San area, and by the end of the campaign on 15 March 1951, some 19,000 guerrillas (over twice as many as had originally been estimated) had been killed or captured. The Communist guerrillas believed that Mt. Chiri could not be taken. Not only was it heavily defended, but the UN armies were still advancing in the north. Who could be sent against them? The South Koreans, realizing what a threat the guerrillas were in their rear area, pulled two divisions from the front lines (the 8th Division and the Capital Division) and sent them to clear the mountain area. In phase 1, the Republic of Korea troops fought to the top of Mt. Chiri and then circled back down; guerrillas trying to escape were captured by police units guarding the roads and escape routes. The impregnable Mt. Chiri fortress was no more. Phase 2 started 8 December 1951 when the Republic of Korea forces moved on the high grounds surrounding Mt. Chiri. Resistance was much lighter and close to 400 guerrillas surrendered. Phase 3 began 15 January 1952. The surviving guerrillas had reassembled on Mt. Chiri so the Republic of Korea forces attacked and took it again. 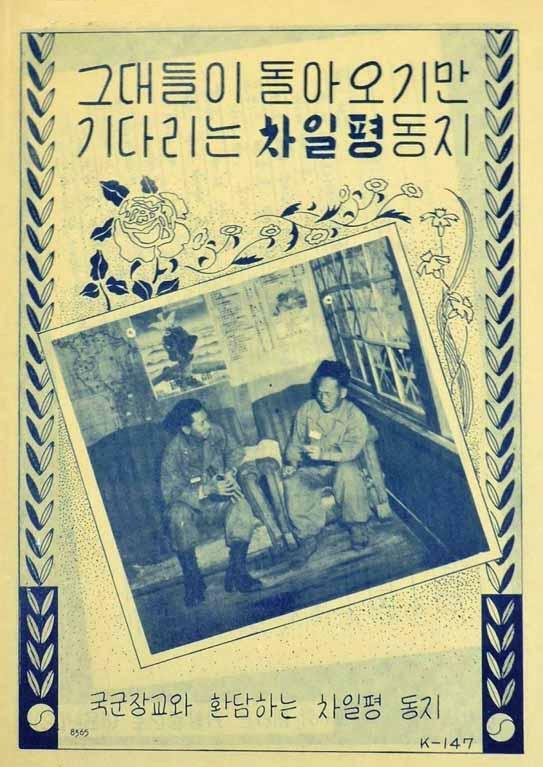 By this time, the Korean civilians realized that the Communists were no longer a power and began cooperating with the ROK Army. The guerrillas could no longer rely on their support, intelligence and food. They faded away. Operation Rat Killer was over and just mopping up operations by local authorities remained. The two Republic of Korea infantry divisions returned to the front lines and the real war. There are different totals for the killed and wounded in that campaign. Official Korean Army records state that 5,800 guerrillas were killed and another 5,700 wounded. Official U.S. Army records say that 9,000 guerrillas were killed. One report we mention below says 25,000 killed or captured. The reader should understand that often these numbers are estimated from blood trails, the size of enemy units, or from a commander who wants a good body count to keep his superiors happy. 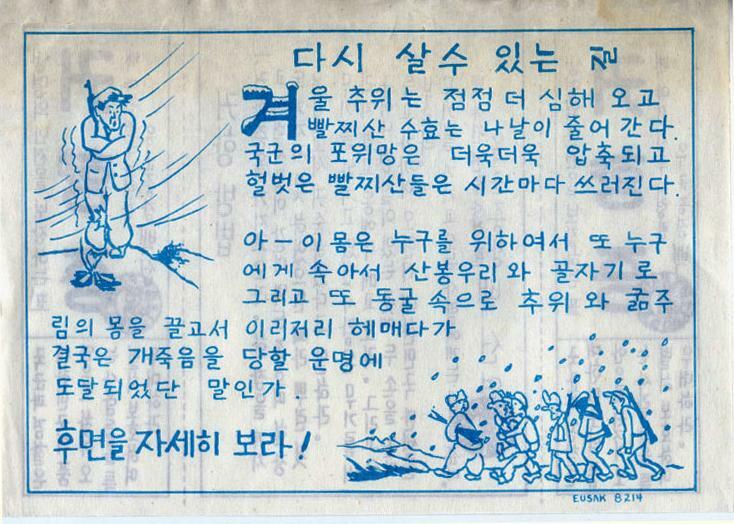 Not all of the anti-Guerrilla leaflets prepared by the UN and Korean forces were for Operation Rat Killer. That was one major campaign. There were numerous attacks and acts of sabotage by various smaller bands of partisans and leaflets were often prepared on a tactical basis just for those operations. From December 1951 to February 1952, Psywar elements actively supported Operation Ratkiller, a Republic of Korea led counterinsurgency effort. During this time Far Eastern Command and Eighth U.S. Army Korea (EUSAK) Psywar elements dropped about 12 million leaflets, directed 9 aerial loudspeaker missions, and conducted almost 300 hours of ground loudspeaker operations in an attempt to break the morale of guerilla forces and convince Korean citizens to stop cooperating with the guerrilla forces. The official history of EUSAK Combat Propaganda Operations by Billy Mossman states that Ratkiller yielded about 9600 prisoners, some 1400-1700 of whom appeared to have surrendered as a result of the Psywar programs. Chung Il-kwon was a Republic of Korea General during the Korean War. Chung graduated from the Tokyo Military Academy in 1940, then joined the Imperial Japanese Army and served in China. Following the Japanese surrender, he served with the Chinese nationalist army. He was Commander in Chief of the Republic Of Korea Army for much of the Korean War, including the Battle of Inchon in 1950 when General Douglas MacArthur landed his troops after being told that it was an impossible task. He left office after a series of embarrassing events occurred during his watch. In order for him not to lose face, he was sent to the United States to attend Ft. Leavenworths Command and General Staff College. Partisans: In the fields and valleys of our battlefield Motherland, spring has come. The severe cold which froze you fingers and swelled your faces has gone, along with the useless resistance of the Peoples Army and the Chinese Communist Forces. Cease senseless fighting and come down at once. 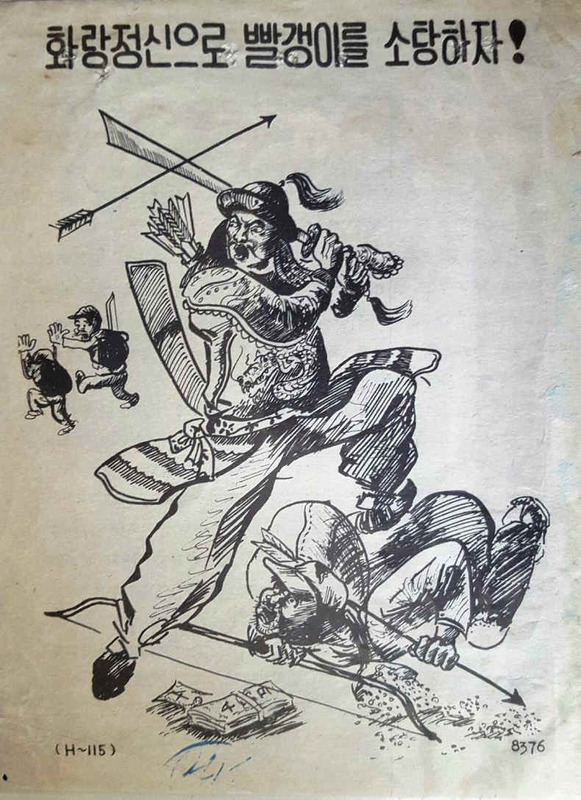 Some other leaflets that bear Chungs picture or signature are: 8126 (South-west guerrillas), and 8516. 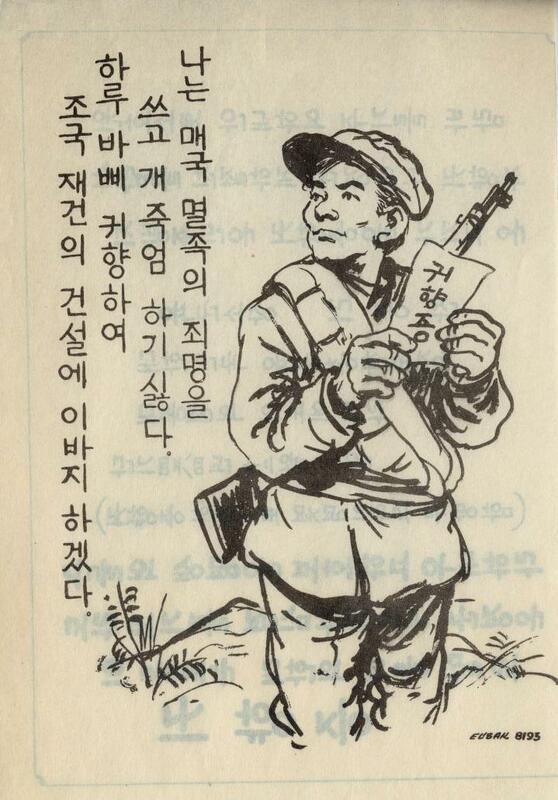 Chungs signature appears on many more leaflets, but they are to North Korean regular forces and not guerrillas. Lieutenant General Lee Chong Chan was the Chief of Staff of the Republic of Korea Army. In July 1952, Korean President Syngman Rhee dismissed the general because Chan refused to use his military power to help Rhee change the nations Constitution. Rhee ordered Chan to send two divisions to Pusan and Lee refused. 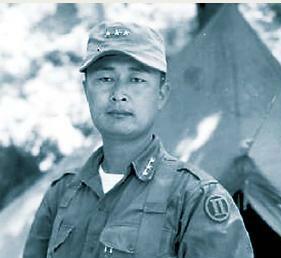 Lee was later given the ROK 2nd Division, but felt it was a slap in the face since he was a former Chief of Staff. He eventually accepted the position. He was replaced by Paik Sun Yup who later become the first South Korean full 4-star general. 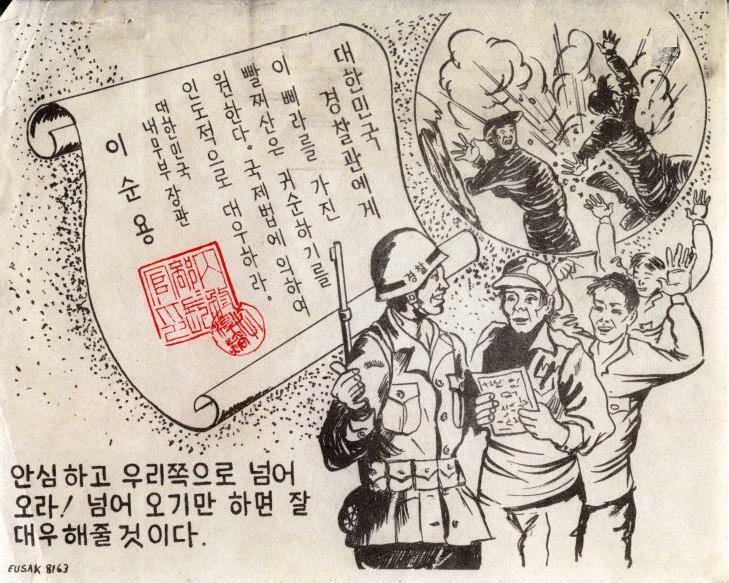 The bearer of this leaflet is determined to become a true citizen of the ROK again, therefore I order the soldiers and police of the ROK Army to guarantee their life and treat them well. 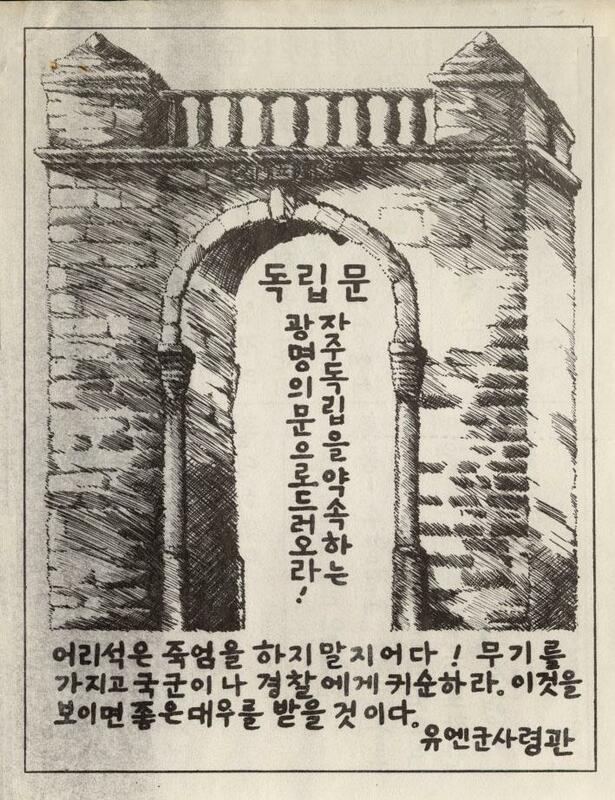 Partisans: Now you are the target of powerful weapons and the only way to survive is to come back to the Republic of Korea. 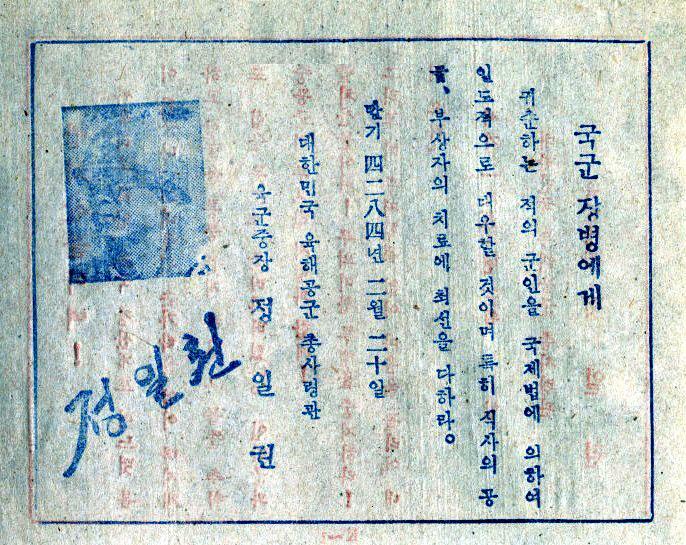 The bearer of this leaflet is determined to become a true citizen of the Republic of Korea again. Therefore, I order the army and the police of the Republic of Korea Army to guarantee his life and treat him well. (Any number of partisans can use one certificate). I require the local residents to guide the bearer of this safe conduct pass to the soldiers and police of the Republic of Korea or to the prisoner-of-war camp. 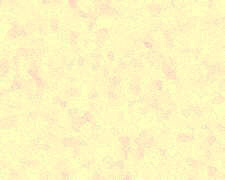 Paik Sun Yup entered Mukden Military Academy of Manchukuo. After graduation, he became an officer of the Manchukuo Imperial Army. He first engaged in Anti-Japanese resistance in eastern Manchuria, later joined the Japanese campaign on northern China for ten months from 1944 to 1945. At the end of the war he returned to Pyongyang but in December 1945 he saw the Communists taking power in North Korea and fled south. He was commissioned a First Lieutenant in the Constabulary, the predecessor of the Republic of Korea Army. In April 1951, Paik was placed in command of the ROK I Corps in charge of eastern Korea. In November 1951, U.S. Army General James Van Fleet ordered Paik to mount a campaign against guerrilla activity in the Chiri Mountains of southwestern Republic of Korea. The guerrillas were conducting well-coordinated raids on rail lines and rear echelon installations. The Republic of Korea I Corps, later named Task Force Paik, began its campaign, dubbed Operation RAT KILLER, in December. When the operation finished in March 1952, Task Force Paik had captured or killed an estimated 25,000 guerillas (see other numbers above). 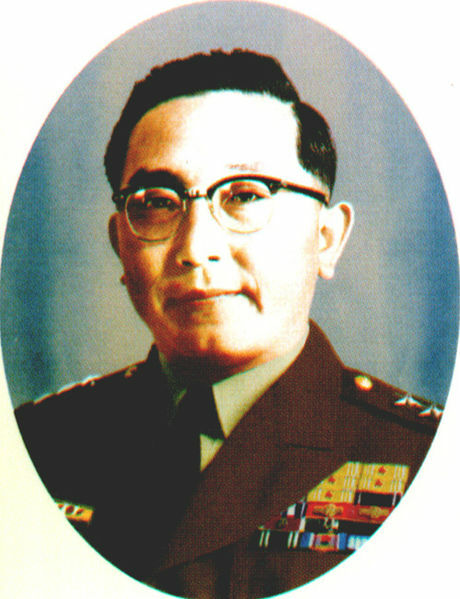 In recognition of the success, he was promoted to Lieutenant General and Task Force Paik was transformed to the new Republic of Korea II Corps On July 23 1952, three and a half months after taking command of the II Corps, General Paik was appointed ROK Army Chief of Staff, the highest position in the ROK Army, replacing General Lee Chong Chan. The weather is getting colder day by day and the number of partisans is decreasing day by day. The ROK forces are pressing the siege circle minute by minute and the weary partisans are dying hour by hour. Is it my fate to die like a dog in these deep mountains? Do not throw your arms away. Bring your arms on your back. Approach the soldier or police with your hands up raised and shout Hurray for the ROK. A reward will be given to those who surrender with their weapons. 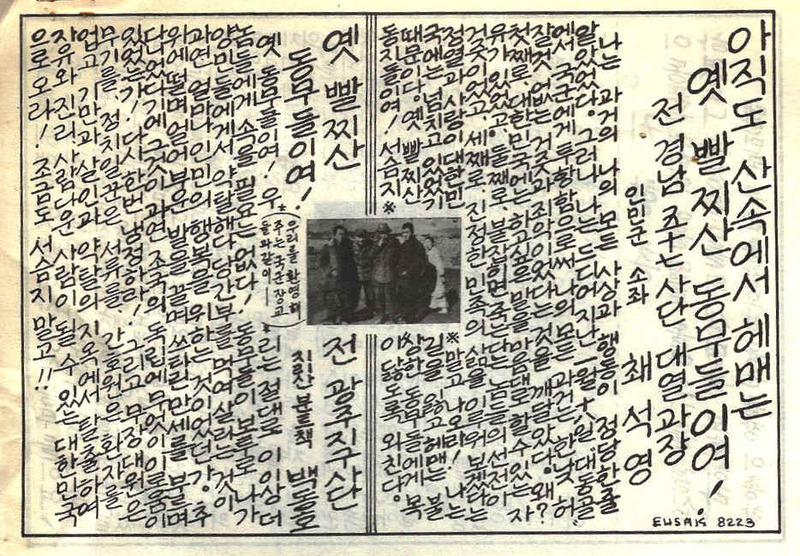 Some of the Eighth U.S. Army leaflets that bear Paiks picture or signature are: 8180 (To Chiri San partisans), 8180A (To all partisans), 8181 (To all Communist sympathizers in Chiri San), 8182 (To the people of Chiri San area), 8185 (The Communists have employed human sea tactics), and 8219 (To partisans). Come over to our side without fear! We will give you good treatment! 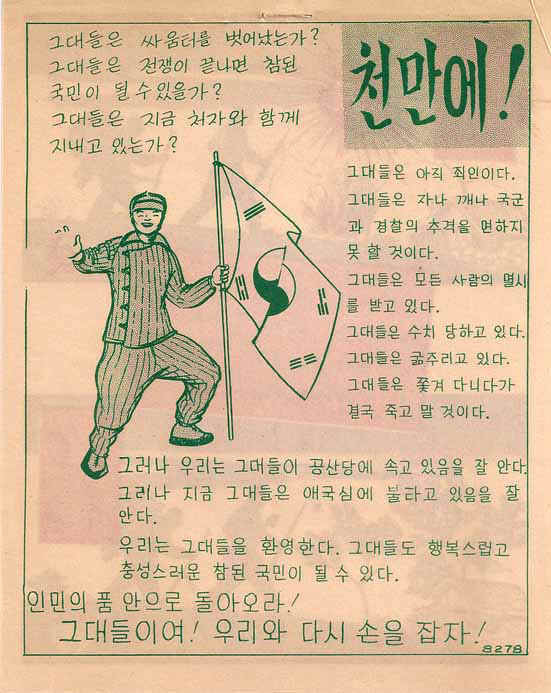 To the Republic of Korea National Police: The partisans with this leaflet desire to cease resistance. Give them humane treatment in accordance with the provisions of International law. Enter onto a road of light that promises you a united and independent Korea. Do not sacrifice your life in useless resistance. 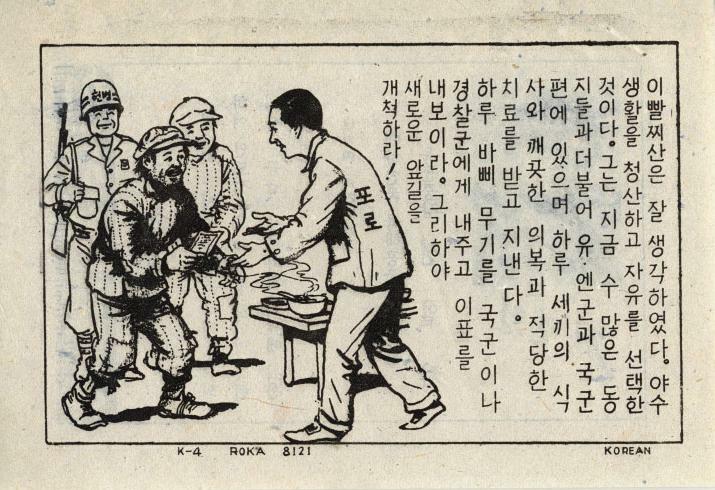 Kaesong  Progress of the UN  Communist peace talks. United Nations reconstruction plans for Korea. Communist purges on the Chinese mainland. Defeat the Communists with the Spirit of Hwarang! Note: Hwarang is a historical group of officers of one of Ancient Korea's kingdoms; Silla. South Koreans like to trace their historical roots to Silla since that nation unified Ancient Korea in the distant past. Silla was originally a Kingdom based in the Gyongsang Province, which is the south eastern part of Korea. North Koreans like to trace their historical roots to Koguryo, the ancient Kingdom based on the Northern part of Korea. It was once very powerful, and fought off and conquered various barbarian tribes before being conquered by Silla. Do not taint the names of your ancestors. Report the Communists. The official South Korean term for bandits is bbarchisan, a butchered pronunciation of the word partisan. The bandits seem to be a mixture of South Korean guerrillas that went feral and North Korean stragglers who were left behind after their forces were cut in two by General MacArthurs Inchon landing operations. Civilians in the area where Communist bandits are being eliminated! You have already experienced the vicious deeds of the Communists. Let us study once more their anti-Democratic and inhuman exploitation. They slaughter your beloved husbands and children. They ruin your rich farming land and set fire to your house; destroy roads; bridges and communication facilities. They confiscate food and horses, pigs, cattle, chickens and other livestock, while telling the people that they are shedding blood for the proletariat. Do you believe that they will carry out a policy which will benefit the people? The Communists shout that they are fighting for the people and the Fatherland, but they insist you prepare for internationalism. Are they not the greatest traitors in history? I thought my ideas and my actions were right. But, I realized that my past was false and criminal after I surrendered to the Republic of Korea Army at Taedong-gol on 18 January. I tell you how I realized that my past was wrong. First of all, I found out that the people of the Republic of Korea have the freedom of speech. Second, I found out that it was false propaganda of the Communists that if the partisans are captured the Republic of Korea Army will kill the partisans. 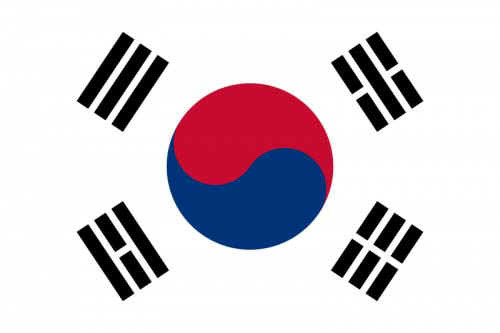 Third, the Republic of Korea has a great passion and deep love in seeking a happier and better life for its people. Partisan Comrades! Do not hesitate! Come out! I appeal honestly to you who have lost the way of life and are wandering in the mountains. My former partisan comrades! We shouldnt be cheated any more by the Communist rascals. You are feeding the Communist leaders by plundering food from innocent people. Is this the righteous action for the happiness of your people? I am hoping that the Republic of Korea Armys elimination of the partisans will be ended soon. Soldiers of the North Korean Army who are wandering in the mountains! Partisans who are still fighting under the supervision of Party leaders against the Republic of Korea Army and suffering from hunger and cold! You think that I and other thousands of your former comrades are dead ; but we are alive and receiving good treatment of which you cannot even imagine from the Republic of Korea Army. Captured guerrillas! Yes, that is what we are, but we receive good treatment. Even though we were captured by the Republic of Korea Army after fighting against them, the Republic of Korea Army treats us warmly with fraternity. Because we are the same blood brothers, the Republic of Korea Army gives us good food and warm clothes. You know that many of your comrades have sacrificed their lives for nothing in this senseless resistance. You also know that many of your friends have left their units and given themselves up to the Republic of Korea. Why do you still hesitate? Do you believe it is your fate to suffer from hunger and cold? Do you think it is heroic to die senselessly, betraying your own country? Do you feel ashamed to come back to the bosom of the Republic of Korea? We have witnessed from the air the miserable scene of you being driven by the Republic of Korea forces from mountain to valley. The Republic of Korea forces will continue to fight until the last one of you is eliminated. Comrades! We hold your life dear. Take the first opportunity. Come back while your heat still beats. Ex-Republic of Korea Soldiers! Come Back Home! Many of your comrades have escaped from the slavery of their life in the North Korean Peoples Army. But many more of you continue to suffer the discrimination and hardship imposed on you because you fought for Korea against the Communist invaders. Have hope.You have not been forgotten. Your family and friends await the joyful day of reunion with you. Watch for and seize your opportunity to escape to the south. Plan now, and escape the yoke of Soviet aggression. How else can your beloved families ever hope to see you again? The days of peace have almost arrived. The war in South Korea could be over. The North Korean Communists have stopped supporting you long ago. The Communists have quit. The war is over for everyone but you. Is the war over for you? No! Are you now at home with wife and child? No! Instead, you are still an outlaw. You will be constantly hunted by the Korean Army and the police. You are despised by your countrymen. You will be hunted and destroyed. Come back to your people. We have been sad since you left. Let us reunite and rejoice. I appeal, with my whole heart, to you who are living a miserable mountain life; being driven from the mountains to the valleys. Come back as soon as possible and start a new life! Comrades! I was one of your high-ranking officers. I am very sorry that I could not bring you with me to the bosom of the Republic of Korea at that time. I regret leaving you alone in the deep mountains. Now I am impressed by the leniency and compassion of the Republic of Korea. I have also started a new life for the reconstruction of our Fatherland. Comrades! Come back at once! 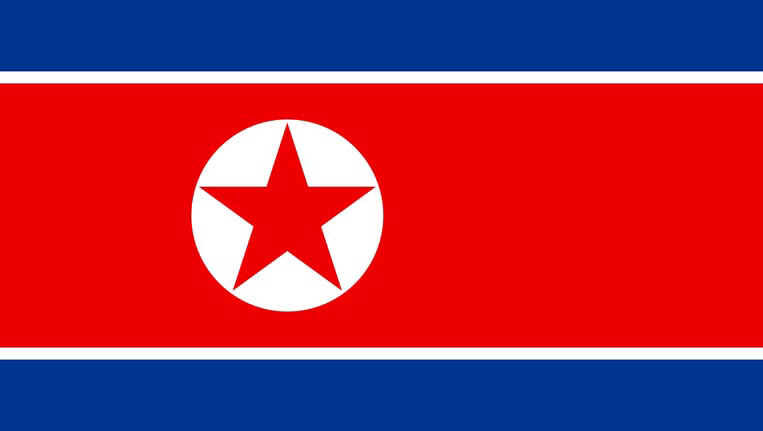 Do not suffer from the cold winter, Come back to the flag of the Republic of Korea. Former Vice-Political Commissar of the Southern Army. Former Professor of the Kim Il Sung University. You can use this leaflet as a safe conduct pass. 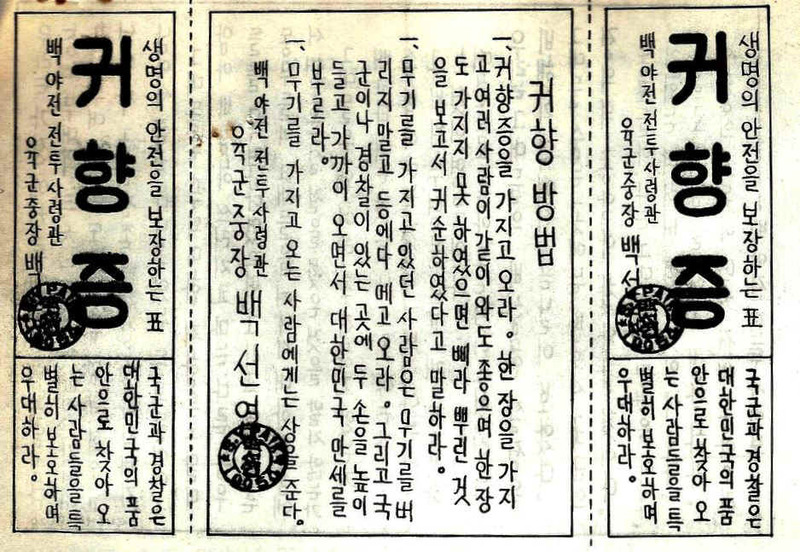 Other unsigned leaflets to the guerrillas are 8118 (Foolish death - waiting wife and children), 8134 (Guerilla newssheet), 8147 (How happy we would be if our soon came home), 8194 (Song of June 25th), 8200 (Letter from guerrilla Cha Il Pyoung), 8218 (ROKA leaflet  To Partisans  Come back! 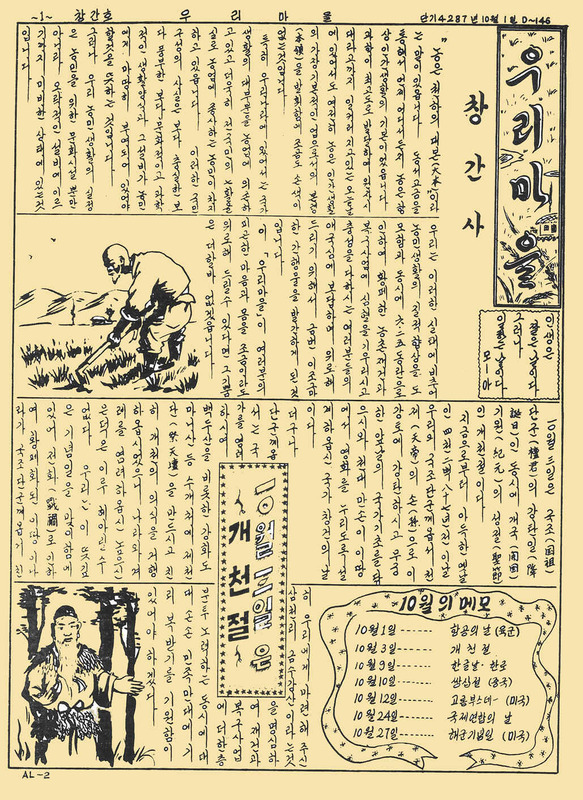 ), 8221 (Special News  Guerrillas in Chulla Province), 8222 (Letter from guerrilla Lee Chung Yul), and 8231 (TF Paik - Letter from guerrillas Ryoo Min Woo and Choi Hong Nye). Lee Hyun Sang is gone! 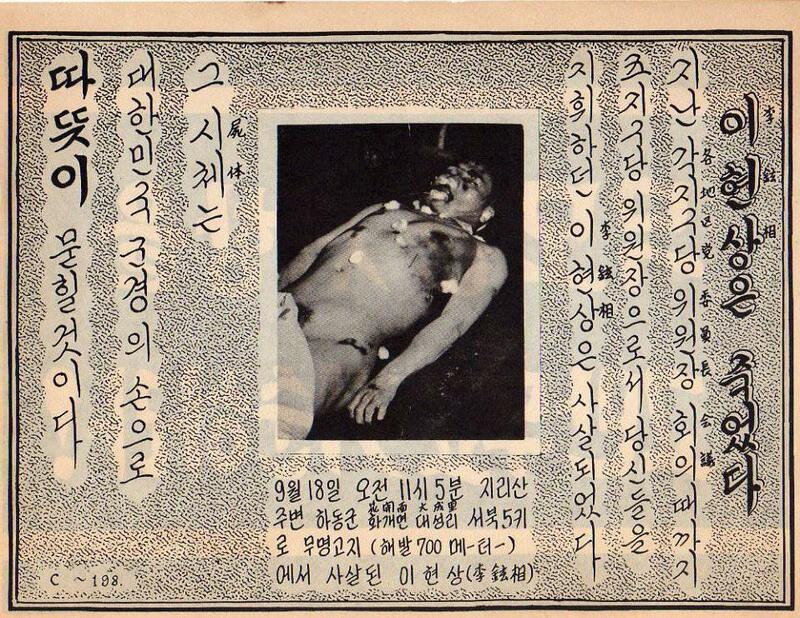 Lee Hyun Sang who commanded you through the joint conference of chairmen of all area parties has been killed. His corpse will be happily interred by a combined military and national police unit. Give up your useless resistance and surrender to us! 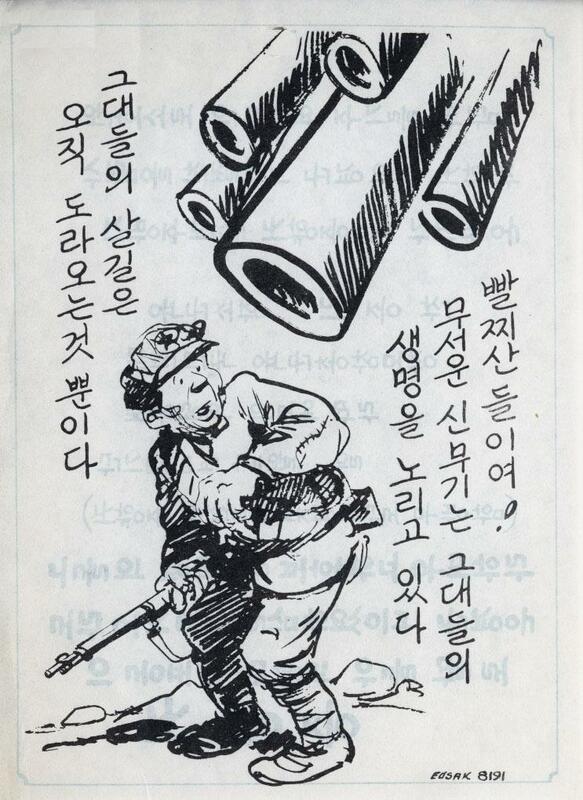 This ends our brief look at Korean War leaflets aimed not at the North Korean or Chinese Armies, but instead at Communist guerrillas left behind in South Korea. The reader should understand that I have just mentioned a very few leaflets here. It is clear that there are many more and as I locate them in my files I might add more leaflets to this story. For the moment, this article is just meant to point out that the Korean War was more involved than most people think, with battles going on both in front of and behind the battle lines. In 2017, I was approached by an author writing a book on actor, singer and poet Rod McKuen. Rod did his basic training in 1953 as in infantryman at Fort Ord, California, and perhaps because he had a radio show in California called Rendezvous with Rod, his advanced training at the Army Public Information School at Ft. Slocum, New York. He served in the U.S. Army from 1953 to 1955, and was first assigned to the Voice of the United Nations Command (VUNC) Radio Station in Japan during the Korean War. 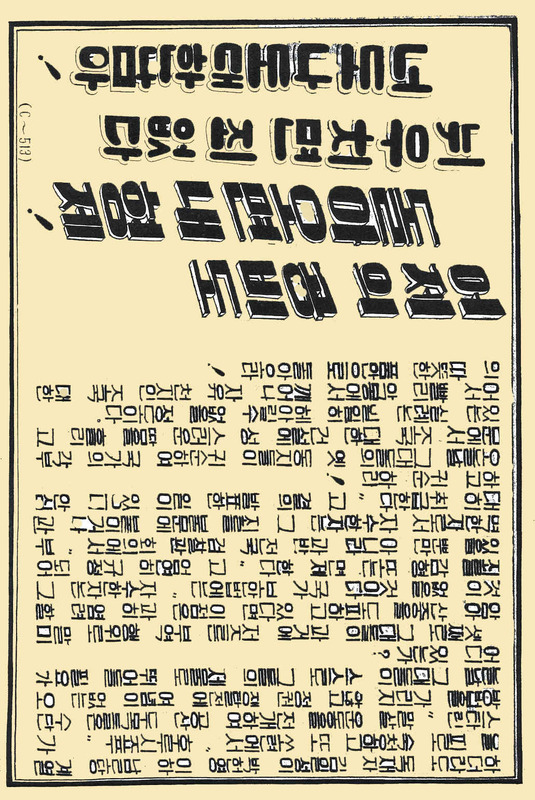 The VUNC went on the air 29 June 1950, four days after the North Korean invasion. It was created by the Far East Command G2 (Intelligence), later called the Psychological Warfare Branch. The studios were borrowed from the Armed Forces Radio Station and the Korean translators were from the Korean Embassy and radio staff from Korea that had escaped to Japan. I was busted from that cushy but dull job, demoted from PFC to plain old private and sent to a unit in Korea. All because I was caught singing after hours in a Tokyo nightclub. After the war, he worked as a Civil Information expert with the Korean Civil Assistance Command in Taegu. McKuen apparently liked to exaggerate, so there is no telling how true some of his comments on the war are. Hello, My Midnight Companion, It's S0 romantic and warm in Seoul tonight, I wish you were here to share this autumn night with me. The idea was to make each North Korean soldier think she was speaking only to him. Defection to the South was the plan. He also claimed his scripts worked so well that there were major defections and he was named a wanted war criminal by North Korea. The author wanted to know what his duties would be and what kind of propaganda might McKeon be involved in after the war. The reader should remember that peace was never declared, and even though the guns had ceased firing, propaganda was still being printed. I told the author all I knew and then remembered that I had several propaganda pieces prepared by the United States in 1955 and 1956. I will add some of those items here with a brief description. This news sheet was printed by the U.S. Army all through the Korean War and I have seen copies of it dated June 1951. When the war was over, the Far East Psychological Warfare Detachment continued to print it. 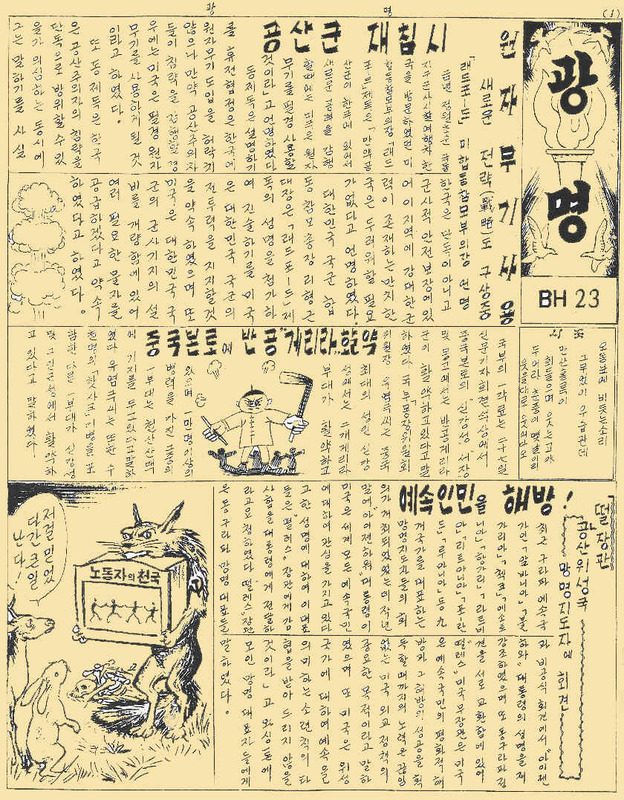 It is a weekly news sheet containing news, photographs and cartoon for the Republic of Korea civilian population. General Taylor received Republic of Korea decoration; San Francisco prepares for U.N.s 10th anniversary; Murder in the demilitarized zone; U.S. Cotton and tobacco to Republic of Korea; The rebuilding of war torn Korea; and VUNC radio schedule. 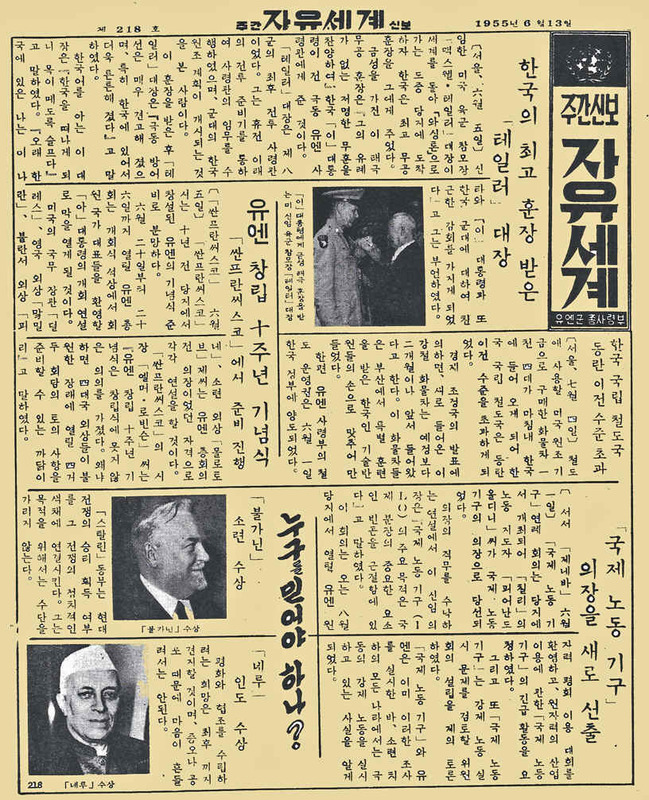 The Communist double-cross in Korea; The Republic of Korea Army is second in the free world; Atomic weapons will be used if the Communists invade again; The frantic purge of East German Communists has filled their jails; and Dulles calls for the liberation of the enslaved people. This leaflet was printed on a poor quality paper. It is 8 x 10-inches, printed all in black and white. It is addressed to Communist Bandits in the Mt. Ilwol area. It was produced by the 2nd Korean Army but as always was printed by the U.S. Eighth Army. It addresses the bandit leader by name and describes the conditions they are living under while other bandit groups have surrendered. It names the bandit leaders that have surrendered. It explains the futility of trying to escape back to North Korea and emphasizes that even if they do make it back north they will be severely punished for their failures. It promises amnesty and welcomes them back to their brothers in the south. 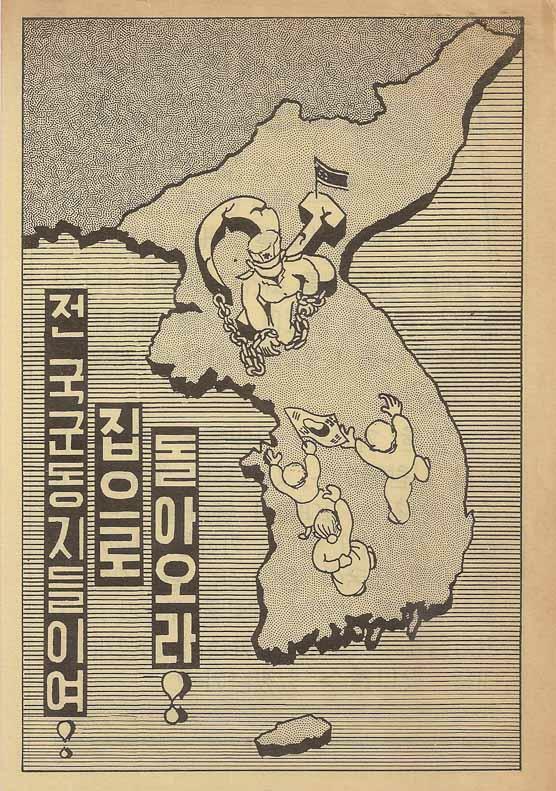 Other types of postwar propaganda include a patriotic calendar (31 August 1954); a waterworks poster entitled More treated water for the people of the Republic of Korea (31 January 1955); a 10th Anniversary of the U.N. poster (14 June 1955) a leprosy poster (12 December 1955), and another large 17 x 21-inch news sheet entitled "Rehabilitation News." Readers who wish to comment on any aspect of this article are encouraged to write the author at sgmbert@hotmail.com.